Housemade sodas with bitters are one specialty at the Greenville Drive-In. Photo courtesy of the Greenville Drive-In. Leigh Van Swall and Dwight Grimm didn’t set out to operate a refurbished 1950s drive-in in the Catskills. They were looking for a place to make small-batch, artisan vermouth. After buying a weekend house in 2008, the couple began experimenting at home, mixing wine and fortified wine with various botanicals such as herbs, spices, seeds and flowers to make vermouth. As an aperitif and a cocktail ingredient, vermouth is largely known in only two forms–sweet and dry–in the U.S., but in other places around the globe, it is served in much wider varieties. Eventually, the hobby led them to seek formal education about botanicals, and the dream of taking their creations to a commercial audience was born. One thing led to another, though. Grimm has a background in video production, and was able to procure a gently used digital projector. As big supporters of local farms and food producers in their personal life, they realized they could sell New York State-made treats at the snack bar and offer a new market to small businesses while still pursuing their original goal. “We just kind of dove in,” said Van Swall, who is originally from Syracuse and has a background in the fashion industry. Grimm grew up mostly in Australia, but his family has roots in the Schoharie Valley that date back to the 18th century. The couple met in New York City, where they lived until relocating upstate. 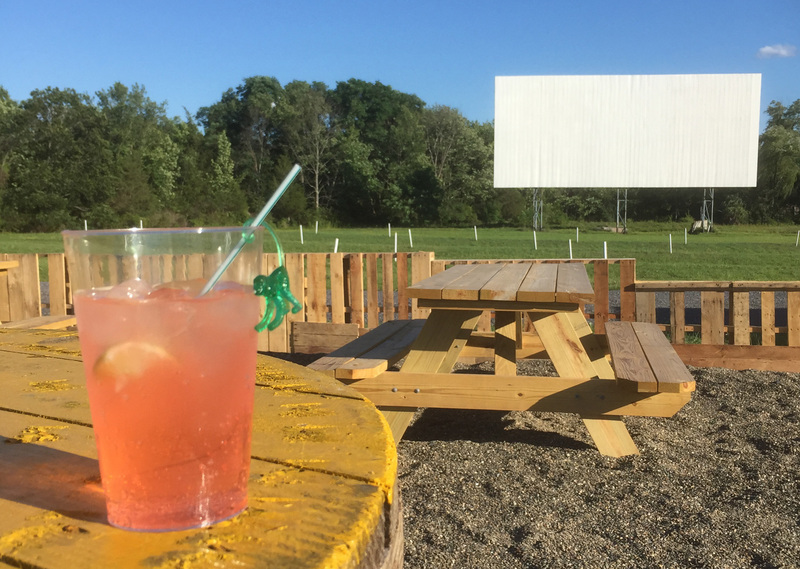 Last month, after a successful Kickstarter campaign helped them raise $22,000, they reopened the dormant Greenville Drive-In. It shows mostly retro and some first-run movies on the weekends, hosts video game nights on Mondays and has a calendar filled with other fun happenings. Future plans include themed events that pair movies with particular interests and foods, such as chocolate. The theater can also host private events, such as birthday parties and corporate gatherings. “When you’re dealing with local producers, you have so much more control,” Grimm said. “We can be so much more flexible and responsive to our customers, and tailor our products to local demand.” For example, the snack bar offers many gluten-free options, including gluten-free hot dog rolls. As opposed to dealing with big corporations, Grimm said, if a local supplier doesn’t have what they need, they might be willing to make it. 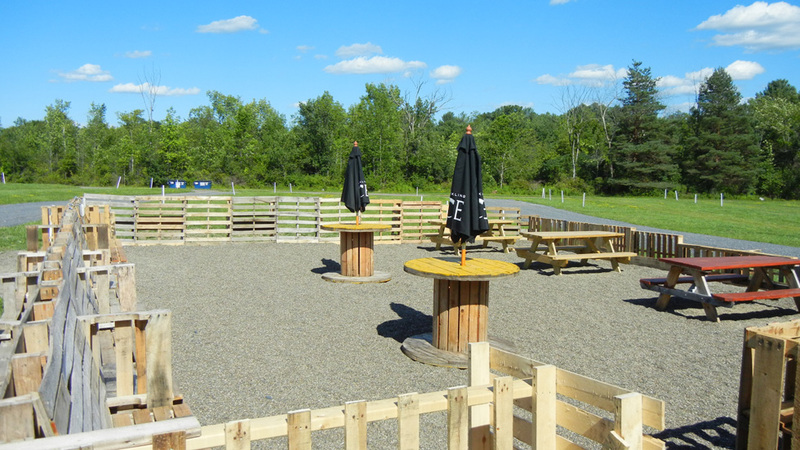 A beer garden constructed entirely of repurposed wooden pallets sits ready for the day–probably this fall–when the drive-in gets its liquor license, which will allow it to host Catskill-area beverage-makers for guest appearances as well as make and sell vermouth. Meanwhile, work on perfecting the housemade vermouth for eventual bottling and sales continues. After attending several workshops at the Carey Institute for Global Good in Resselaerville on topics such as mead, Grimm took an intensive, six-weekend-long botanical medicine course at the Herbal Bear School of Medicine in Grand Gorge. Among the plants the couple works with are milkweed, St. John’s wort and autumn olive berry, an edible invasive plant that grows on their farm in Albany County. It’s high in antioxidants and has an interesting flavor, Van Swall said. 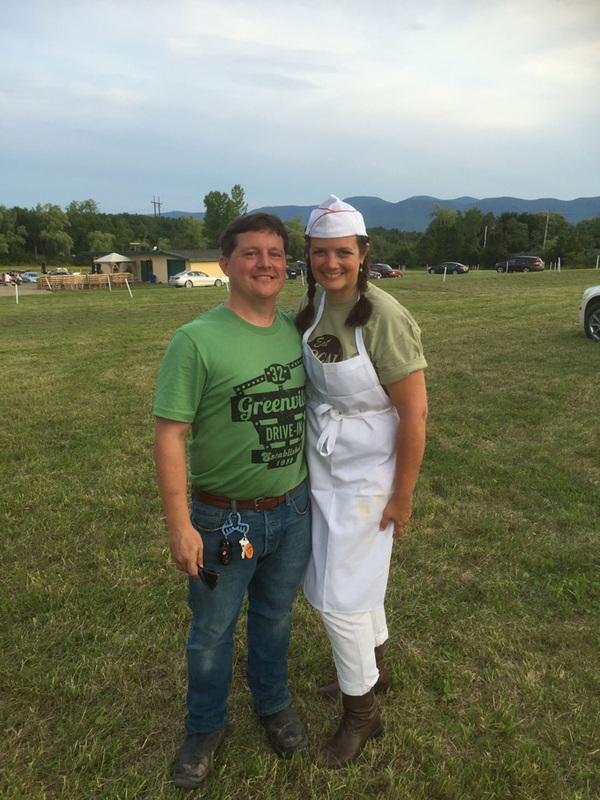 Dwight Grimm and Leigh Van Swall set out to make a vermouthery and wound up with a drive-in. Photo courtesy of Greenville Drive-In. At the theater, business is growing steadily. 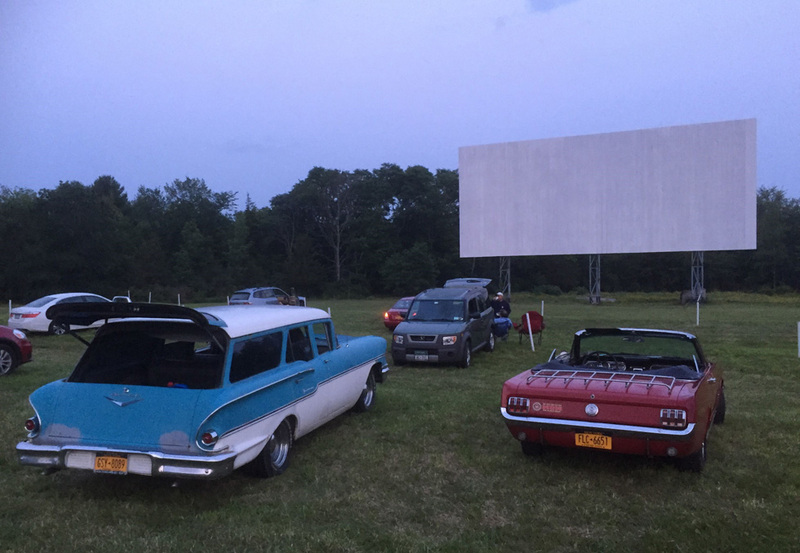 Local residents who grew up watching movies at the drive-in now come in with their grandchildren, reminiscing about their own childhoods of cinema under the stars. While the adventure of operating a drive-in came about by accident, Grimm and Van Swall now realize that it has created a ready-made venue and audience for many other adventures–which would not have happened if they’d opened a small vermouth tasting room on a remote back road at their farm. The theater is also a great outlet for supporting the arts community, Van Swall said, noting an upcoming showing of a local filmmaker’s work. “As we develop as a creative community here, we have this great space to make things happen,” she said. Find the Greenville Drive-In at 10700 Route 32 in Greenville. Doors open at 7 p.m. and movies begin around dusk. Tickets are $5 for all patrons over 5; children under 5 are free. Leashed dogs are allowed with a free “pup pass.” The movie schedule is on the website and on Facebook. This weekend’s feature is Ant-Man.